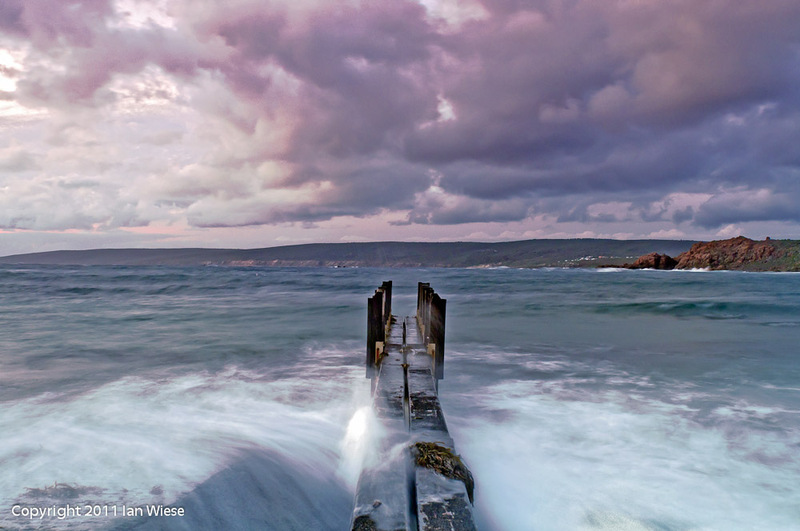 The Quindalup jetty has been attracting the attention of photographers over recent years. In the 2011 Epson International Pano Awards, 4 images of the top 50 Nature Amateur and the top 50 Nature Professional results were images of the Cape to Cape region of Western Australia (ie they were from my backyard). 2 of these images were of the Quindalup Jetty. No other structure worldwide was so well awarded! Nor was any other region. I have even posted a few images of the Quindalup jetty myself. However the Quindalup jetty has a lesser known brother – the Canal Rocks jetty. In rough weather (pretty common on this relatively unprotected coast) I doubt the boat ramp is much good for launching boats (would you back your car into this? ), but it does offer some good opportunities for photographers. It works because the ramp on the left is higher than the ramp on the right, so you get these patterns of water flow as the waves spill from the top ramp to the bottom. Just watch out for the unexpected big wave. This entry was posted on May 31, 2011 by ianwiese. It was filed under Canal Rocks, Landscape and was tagged with boat ramp, Canal Rocks, Water movement. I even got wet feet photographing it!